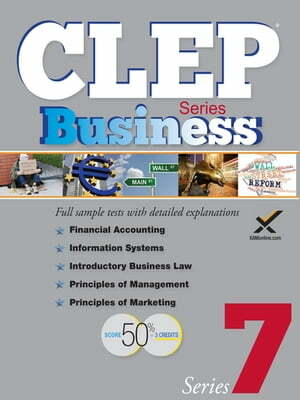 Collins Booksellers - CLEP Business Series 2017 by Sharon A Wynne, 9781607875987. Buy this book online. If reducing your college costs are appealing to you then CLEP offers a way to do that by testing out of a requirement or even an elective. When you answer 50% correct your college will not charge you for the course so that much is FREE! Is that a few hundred or even a thousand dollars back in your pocket plus the interest over seven years on that money! The bonus is you also fast track out of college or take more of the courses you may find even more appealing or advanced. It is a total win to save time and money with the trusted XAMonline test prep, the CLEP specialist company. Check your college requirements and if you can fit one or more of these tests to meet those requirements you will earn up to 3 credits per test and that is smart money and use of time. There are no prerequisites to taking the test, just confidence and subject matter expertise, regardless of how you acquired it. If you have determined that mathematics is one of your stronger areas of expertise then this product affords you a unique opportunity to compare tests within subject matter category. Discover full length tests with full explanations, all available as eBooks or print books. Each sample test goes thru a process so that standards are covered and weighted and the end result is that you get the true to format and true to test experience. Each test has not only an answer key but also a detailed explanations. These are two advantages over the College Board products which are neither full length or have explanations.